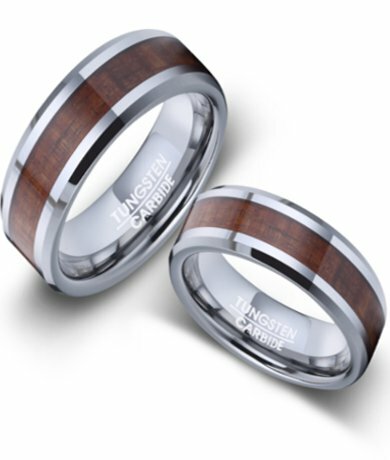 Classic yet utterly unique, this his and hers tungsten ring with Koa wood inlay offers a handsome alternative to more traditional wedding bands. Rich Koa wood runs eternity style down the center of this ring, and is perfectly highlighted by polished beveled edges. Comfort-fit rings should be ordered 1/2 size smaller! Promotion: The listed price is for one ring only. Add a second matching ring and get 10% off your purchase! THIS RING IS VERY COOL! IT IS HEAVY, GOOD QUALITY AND GORGEOUS IN PERSON. So far so good. I was a little worried about purchasing a ring for such a deal; assuming that it would easily fall apart. So far it's still in good condition (although it's only been 11 days), arrived quickly, and we love it. It's definitely sturdy and I'm hoping that it lasts forever! After months of my fiancé looking for the perfect ring, he picked out this one. I love surprises so, of course, I ordered it without him knowing. As soon as we got it in, he wanted to try it on. He LOVES this ring. It is exactly what he was hoping it would be like. To me, it's thick and heavy but I'm used to my delicate diamond on my tiny hand. To him, he says it's incredibly comfortable and he can't wait to wear it forever.